Fats get a bad rap, and sometimes it’s confusing to know whether you should be eating it. TV says No, while others experts say yes. So what are you supposed to believe? The truth is, there are no good foods or bad foods, but excess amounts of calories (including fats) can decrease your health and quality of life. When we get down to the bottom of it, a balanced diet of whole and unprocessed foods is the safest. This goes without saying, but if you’re allergic to a specific food, don’t eat it. I’ve heard of people devouring eggs because their doctor told them they needed to eat them, meanwhile they were allergic to them. But the reality is, we need dietary fats for our body to work how it’s supposed to. Let’s take a quick look at the three main types of fat that’s main difference comes from the ‘bond structure’ of the molecules. In fact, fats do lots of good things for your body. They support a healthy metabolism, nutrition absorption, improves tissue quality throughout your body, proper hormone production, preserve memory, eye health and more. If we’re talking about a dietary perspective, fats have a strong proven background to help you feel fuller between your meals, improve body composition, and reduce depression. Dietary fats have six big-time roles in making sure our body functions properly. When you eat fats, they are either used, stored in fat tissue or stored in organs. For this reason, the fats we eat become part of us and can affect how our body acts. Remember the six big-time roles I mentioned a little bit ago. It easy to see how the fat we eat can affect our bodies if it’s not good for us. Monounsaturated and polyunsaturated fats are what most refer to as healthy fats. … trans-fat which is in most processed foods … cooking oils like soybean, corn oil, and other cooking oils that never go bad. … hydrogenated fats which are in foods like margarine. In recent years saturated fat have gained popularity and switched in the eyes of doctors and health professionals. Prior to this saturated fat had a bad wrap but in recent findings it supports the enhancement of good cholesterol. A healthy balance of all three fats is excellent, but what you want to eat less of are the ones who are in processed foods and are non-perishable. Even healthy fats have a lot of calories which can lead to weight gain if you overdo it. In the end, this can cause health problems. 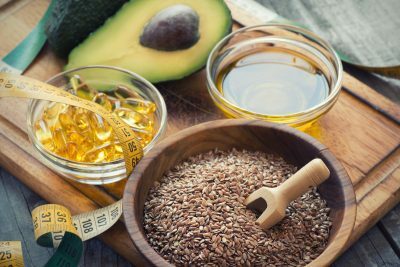 When you start to add good fats into your diet, start with whole foods like raw nuts or seeds, avocados, fatty fish, fatty meat, pasteurized butter, or full-fat dairy. If you’re going to start using cooking oils be sure to look for extra-virgin or cold pressed oils and be careful with how much you are using. This is easy to overdo. Don’t worry about exact percentages for the time being but be sure to avoid artificially made fats. Start by taking a look at your current fat intake and seeing where you can make small improvements. It may be as simple as switching your processed fat intake, so your fats come from whole foods. Maybe you need to add omega-3 fatty acids from fish or a fish oil supplement. If you have any severe medical conditions check with your doctor before supplementing with omega-3s. As always, if you have any questions join Compel Fit Club ==> HERE and ask away! Good luck and I hope this helped solve the fat dilemma once and for all.